On Halloween, a really bad day for the dumpster fire that is the Trump Presidency, Our Bronze Creon issued his proclamation that November is Native American Heritage Month. Traditionally this proclamation is made on the last day in October, and usually it garners little attention. 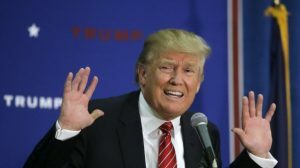 Still, other than his announcement several months back that he had decided to reverse the Obama Administration’s belated halt to the Dakota Access Pipeline, President Trump has had nothing to say about Native American issues. At a certain level, that is understandable. The entire presidency is wobbling under the existential threat posed by the Mueller investigation. But here, as elsewhere, it is worth looking at what Our Bronze Creon has had to say. And here, as elsewhere, his words and his deeds pale in comparison to those of his predecessors. Trump’s proclamation begins with a bit of meaningless fluff, noting that “American Indians and Alaska Natives are inextricably linked with the history of the United States.” Ignoring the many earlier efforts at settlement throughout the Americas, including the Jamestown settlement beginning in 1607, Trump strangely chose to open with the assertion that “Beginning with the Pilgrims’ arrival at Plymouth Colony and continuing until the present day, Native American’s contributions are woven deeply into our Nation’s rich tapestry.” We will give him a pass on that misplaced apostrophe–it is a frustrating mistake my students make as well. But it is odd, isn’t it, that a President who has expressed such fascination with the Senator from Massachusetts who he has derisively dubbed “Pocahontas” would ignore the English efforts to plant a colony in Virginia? There was a time in American historical writing when New Englanders, Virginians, and North Carolinians all competed to make their state the birthplace of the United States. Trump apparently and uncharacteristically has come down with Massachusetts. His proclamation honored “the contributions and sacrifices” made by Native Americans. Those contributions included military service, assistance to the first European settlers and, in a sideways glance at the discredited “Iroquois Influence” thesis, the gift of “democratic ideas to our constitutional Framers.” Trump’s predecessors also occasionally mentioned the notion that the United States Constitution and American democracy were influenced or shaped by Native American antecedents, but the number of published scholars who find this view persuasive can be counted on one hand. This is all highly general. Nothing specific here at all, and little awareness of what the words he used mean. Self-determination? Not much of that thus far, except for a commitment to allow those tribes interested in developing their coal resources, like the Crows, to start digging. There is scant evidence that the Trump administration has any interest in tribal sovereignty, and Interior Department press releases say little more than the President did here: that the government will cut regulations that hold Indian country back. If you find this a paltry solution to the challenges native peoples face, and the wide range of issues with which they contend, you can request a meeting with the Assistant Secretary of the Interior for Indian Affairs by filling out this form right here. You might want to be a bit flexible in scheduling, as Secretary of the Interior Ryan Zinke’s choice to head the Bureau of Indian Affairs has only been on the job for two weeks. You can look over the posts on this blog, and it will not take you long to see that I have been very critical of the President. But I wanted to be fair on this, so I read earlier proclamations by Trump’s predecessors of Native American Heritage Month. During the National American Indian Heritage Month, as we celebrate the fascinating history and time-honored traditions of Native Americans, we also look to the future. Our Constitution affirms a special relationship between the Federal Government and Indian tribes and — despite a number of conflicts, inequities, and changes over the years — our unique government-to-government relationship has endured. In recent years, we have strengthened and renewed this relationship. Today we reaffirm our support for increased Indian control over tribal government affairs, and we look forward to still greater economic independence and self-sufficiency for Native Americans. 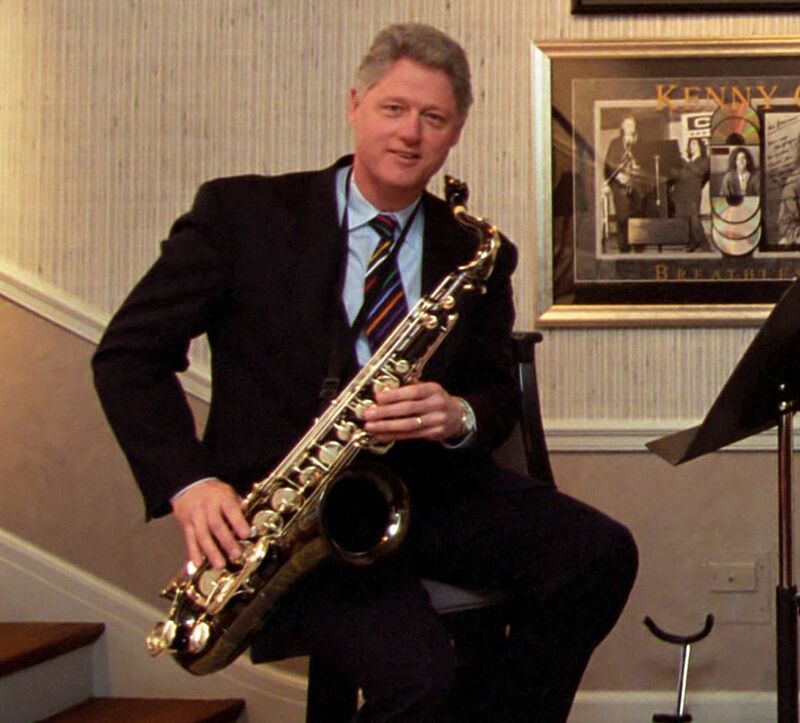 Unlike President Trump, Bill Clinton in the final year of his presidency remembered both the accomplishments of native peoples and the consequences they had suffered as a result of the nation’s past policies. “This month,” he said in November of 2000, “we celebrate the culture and contributions of the first Americans,” but also “remember with sorrow the suffering they endured because of past Federal actions and policies that had long-term and often devastating consequences for Native Americans and their culture.” Clinton’s presidency was one of importance for native peoples, and he looked forward. “As the new millennium dawns, there is reason for optimism,” he stated. “During my 1999 New Markets tour of the Pine Ridge reservation in South Dakota and my visit to the Navajo Nation in New Mexico in April of this year, I saw firsthand a strength of spirit and hope sweeping through Indian Country.” He said his administration had worked hard to help native communities “through economic development initiatives and improved education and health care.” His tone was retrospective. He was proud of what his administration was done but, conscious that its time was coming to an end, that there was so much more he wished he could do. We still have much to accomplish, however. While my Administration has worked hard to bridge the digital divide and bring the Information Superhighway to Indian Country, some areas still do not have telephone and power lines. We continue striving to provide American Indians with the tools they need to strengthen family and community life by fighting poverty, crime, alcohol and drug abuse, and domestic violence, and we are working with tribes to improve academic achievement and strengthen tribal colleges. We are also seeking to ensure that tribal leaders have a voice equal to that of Federal and State officials in addressing issues of concern to all our citizens. I reaffirmed that commitment to tribal sovereignty and self-determination by issuing this month a revised Executive Order on Consultation and Coordination with Indian Tribal Governments. This order builds on prior actions and strengthens our government-to-government relationship with Indian tribes by ensuring that all Executive departments and agencies consult with Indian tribes and respect tribal sovereignty as the agencies consider policy initiatives that affect Indian communities. This year, my Administration proposed the largest budget increase ever for a comprehensive Native American initiative for health care, education, infrastructure, and economic development. Just last month, as part of the Department of the Interior appropriations legislation, I signed into law one segment of this budget initiative that includes significant investments for school construction in Indian Country and the largest funding increase ever for the Indian Health Service. These are the kinds of investments that will empower tribal communities to address an array of needs and, ultimately, to achieve a better standard of living. Back in 1994, when I first met with the tribal leaders of more than 500 Indian nations at the White House, I saw the strength and determination that have enabled Native Americans to overcome extraordinary barriers and protect their hard-won civil and political rights. Since then, by working together, we have established a new standard for Federal Indian policy–one that promotes an effective government-to-government relationship between the Federal Government and the tribes, and that seeks to ensure greater prosperity, self-reliance, and hope for all Native Americans. While we cannot erase the tragedies of the past, we can create a future where all of our country’s people share in America’s great promise. It is, quite simply, a statement that stands in stark contrast to the Trump administration’s perfunctory proclamation. George W. Bush’s proclamations, similarly, were brief, but managed to avoid the mailed-in, bored tone of the Trump announcement. Bush could point to some minor legislative accomplishments, and pledged to preserve the “nation to nation” relationship between the United States and native peoples and sovereignty and self-determination. It is not enough to argue that these differences are matters of style. They are. But they reflect differences in policy as well. All presidents state their support for self-determination. They all work to uphold tribal sovereignty, they say. But few of them think through what those words mean, and contemplate meaningful policies to honor these pledges. Obama himself was slow to act in important areas. He acted on Dakota Access only at the last second, and arguably too late to implement policy changes that would not be so easily set aside by President Trump. But he did have much to point to, and he did so in his last proclamation in 2016. Over our long shared history, there have been too many unfortunate chapters of pain and tragedy, discrimination and injustice. We must acknowledge that history while recognizing that the future is still ours to write. That is why my Administration remains dedicated to strengthening our government-to-government relationships with tribal nations and working to improve the lives of all our people. Three years ago, I issued an Executive Order establishing the White House Council on Native American Affairs to help ensure the Federal Government engages in true and lasting relationships with tribes and promotes the development of prosperous and resilient tribal communities. Last month, I hosted the eighth Tribal Nations Conference and brought tribal leaders together to identify key issues we still face. We have worked to better protect sacred lands and restored many acres of tribal homelands, as well as supported greater representation of indigenous peoples before the United Nations and called for further implementation of the Declaration of the Rights of Indigenous Peoples. And we have taken steps to strengthen tribal sovereignty in criminal justice matters, including through the Tribal Law and Order Act. 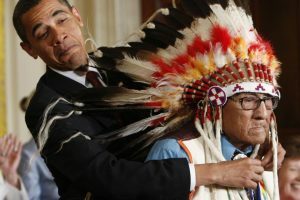 I have written on this blog about how consequential a presidency I thought Obama’s was for Native American communities. His accomplishments, compared to that of his predecessors, were significant. He was entirely justified in talking about them in his proclamation. But now, sadly, as we struggle through the first year of a presidency that has been mired in crisis and scandal from the moment it began in January of 2017, that has stirred up racial division in the country and apologized and excused public displays of white supremacy, and that has shown outright hostility to the causes and concerns of peoples of color, the pursuit of that “brighter future” mentioned by President Obama seems to have been set aside. And that is just one more tragedy of the presidency of Our Bronze Creon, one more component of the electoral nightmare that began last November. It is one thing for a President to be “unconventional” and, as his dwindling number of supporters argue, to be unconcerned about being “politically correct.” It is another matter entirely to show, through sins of omission and commission, that he could not possibly care less.